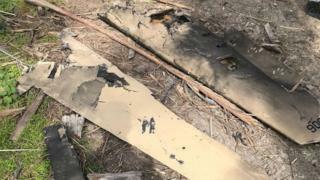 Israel has said the Iranian drone it shot down in February was loaded with explosives and "tasked to attack". On Friday, Israel's military said that it came to the conclusion after "flight path analysis" and an "intelligence-based investigation" of the remnants. Israel said its "combat helicopters prevented the attack Iran had hoped to carry out in Israeli territory". The drone was launched from an airbase in Syria, against which Israel later carried out air strikes. Israel lost one of its F-16 planes in the counter-offensive - a rare loss for the Israeli air force, though both crew members survived after ejecting. The same airbase - known as T4 - came under attack again on Monday, two months after the Iranian drone was allegedly launched from the area. Syria and Russia said the latest attack, which killed 14 people, was also carried out by Israel, which declined to comment. Seven Iranians were among those killed. In an interview with the BBC in late February, Iran's deputy foreign minister refused to confirm that Iran had sent the drone into Israel and said that the drone belonged to the Syrian army. It was shot down on 10 February in the country's far north, once it crossed the border. "It should be noted that the UAV was identified and tracked by Israeli defence systems until its destruction, effectively eliminating any threat the Iranian aircraft posed while flying towards Israeli territory," the Israeli military said in its statement. Iran and Israel are long-standing enemies, and Iran has been accused of deliberately building up a force inside Syria, Israel's north-eastern neighbour. Iran is the major regional ally of Syrian President Bashar al-Assad. It has also been accused of supplying weaponry to Lebanese Shia militant group Hezbollah, an enemy of Israel which has a strong force in Syria. In late 2017, Israeli Prime Minister Benjamin Netanyahu said: "Iran wants to establish itself militarily in Syria, right next to Israel." He added: "Israel will not let that happen."